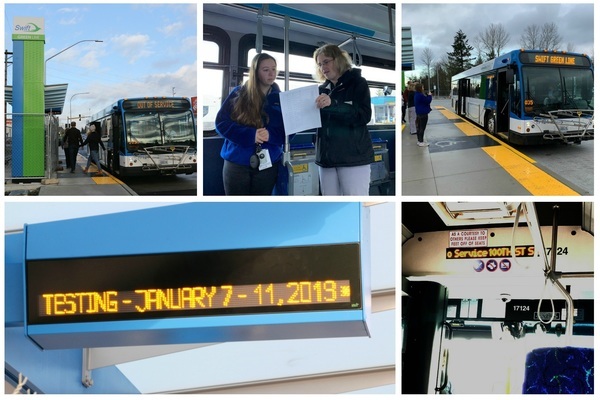 Earlier this month, Community Transit staff hit the streets of the Swift Green Line corridor to test real-time data displayed on customer-facing systems. Information on “next bus” signs. Audible call-outs inside the bus. Automatic counting of customers boarding and de-boarding the bus. Visibility and real-time information on BusFinder. Testers discovered that station names were appearing incorrectly on “next bus” signs, and that audible call-outs needed more landmark information. The team made corrections, released updated data, and then confirmed that the issues had been corrected. Based on customer feedback, testers also reviewed the volume and clarity of the audible call-outs. More testing will occur later to ensure the call-outs are easy to hear and understand. Janice Hellman, the agency’s data supervisor who helped orchestrate the testing exercise, said that it was vital to experience the new bus rapid transit line as a customer would. “We want to ensure that our customers have a great experience on Swift Green Line from day one,” she said. It's winter, and Swift Green Line is coming. If you've been watching the construction of the new stations, you've noticed that they are beginning to look nearly complete; many have information kiosks, ticket vending machines and even windscreens in place. Tuesday, Jan. 22 at noon. 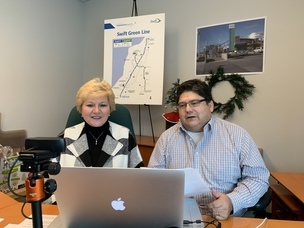 Eat your lunch with June and Martin while they spend 30 minutes giving you the latest Swift Green Line construction updates. They'll be available to answer your questions in real time, too! If you cannot attend the live webcast, you can submit questions ahead of time and view the recording later at https://www.communitytransit.org/CTLive. A 30-minute webcast covering the latest Swift Green Line news and answering your Community Transit questions. An expanded 45-minute webcast covering the March service change. An expanded 45-minute webcast covering the March service change and upcoming Swift Green Line launch events. Construction on the Swift Green Line stations continues to occur in phases, with each phase starting at the north end of the route and making its way south. All stations are finished with heavy construction, and are in various stages of receiving electronic amenities (ticket vending machines, ORCA card readers, “next bus” signs) and physical amenities (windscreen, railings, benches). Four local bus stops needed to be closed during Swift Green Line station construction because they were too close to construction activity to be safe for bus riders boarding and deboarding the buses. 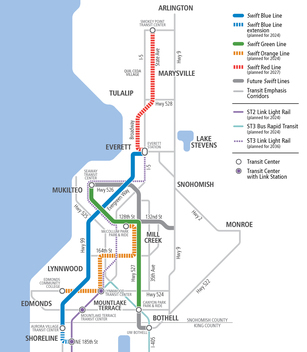 The local stops on Bothell-Everett Hwy. and Trillium Blvd. (stop #2646 and stop #2651) will remain closed due to uneven walkways and a steep drop-off. If you ride a local bus affected by these stops, subscribing to electronic Rider Alerts will notify you as soon as the stops are open. Subscribe for either email or text alerts (or both) at www.communitytransit.org/subscribe. To see the status of these stops without subscribing to an alert, visit bit.ly/GreenLineLocalStops.